Madden NFL 15 will be available on August 26 in North America and on August 29 in the EU for Xbox One, PlayStation 4, Xbox 360 and the PlayStation 3. 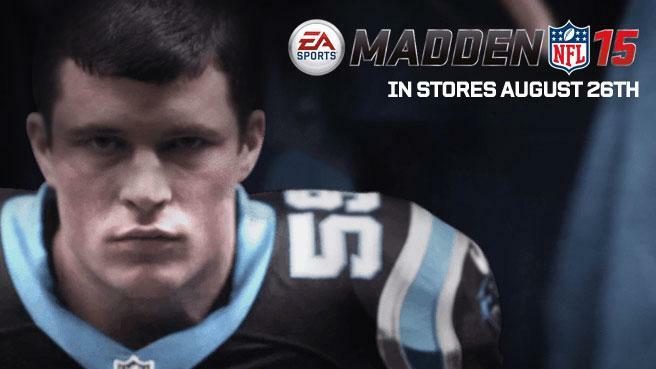 The first Madden NFL 15 video, featuring Carolina Panthers linebacker and Defensive Player of the Year Luke Kuechly, can be seen below. Madden NFL 15 delivers everything fans need to own their rivals on both sides of the field, including the most immersive defensive gameplay control in franchise history. Like the Super Bowl XLVIII champion Seattle Seahawks, you can win championships and bask in the glory of success by building a great defense fit to challenge the best offenses in the game. Fans will also experience an entirely new broadcast presentation that delivers Madden NFL game day like never before with dramatic all-new camera angles, as well as dynamic pre-game and halftime features. It’s not just football, it’s Madden Season. Madden NFL 15 is available Tuesday, August 26. Click here to pre-order.